Book title : What Is Your True Zodiac Sign? Yes, there are things in life that are too complicated to explain in layman language and in such case Astrology comes to our rescue. Who wouldn’t have heard of Linda Goodman? Who wouldn’t have referred to Bejan Daruwala’s horoscopes? Everyone reads horoscopes even if they do not believe in the science. 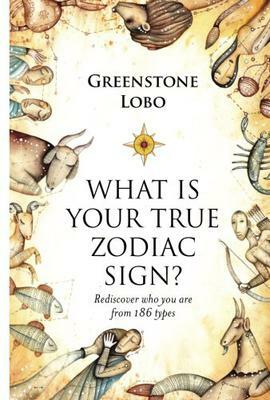 Greenstone Lobo’s ‘What is your true zodiac sign?’ is a book that will serve the reading buds of all those who want to delve into the astrological science even more. With this book, the author has touched upon the art of finding out one’s true sign. The target audience for this book is definitely not the ones who have already read the entire Goodman collection, for this aims to explain or rather introduce the Vedic astrology system. For cusp signs, this would come in handy as they might find the descriptions relatable. As for me, being a Piscean I could relate to only 25% of what was mentioned under the heading. I am not a cusp and it was difficult to believe that most of the personality traits were contradictory to what I am. Without any doubt, I have to compliment the presentation of the book- the cover, the font, the content and the thickness; it was all very enticing. This book explores the behavior patterns and the personality traits of one’s counterpart too. But this isn’t anything new. I would rather go for Linda Goodman than this. Barring some printing errors, this can be an entertaining read for all the first timers. Nevertheless, this book does not leave its readers like a lost ball in high weeds, for most of it is quite relatable. And owing to the human tendency and their love of being told what and how they are, this book serves the purpose. All said and done, the book is a delightful read. But more preciseness and inclusion of other areas other than compatibility could have worked in favour of the author.